We bet you thought Wii accessories couldn't get any more stupid, didn't you? Oh, silly you! 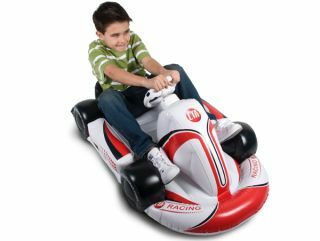 How about this one, the inflatable Race Kart for Wii, created by third-party peripheral maker CTA Digital? Is it stupid enough for you? Does it make you question the direction human evolution has taken over the last million years to lead us all to this very bad place at this precise moment in time?